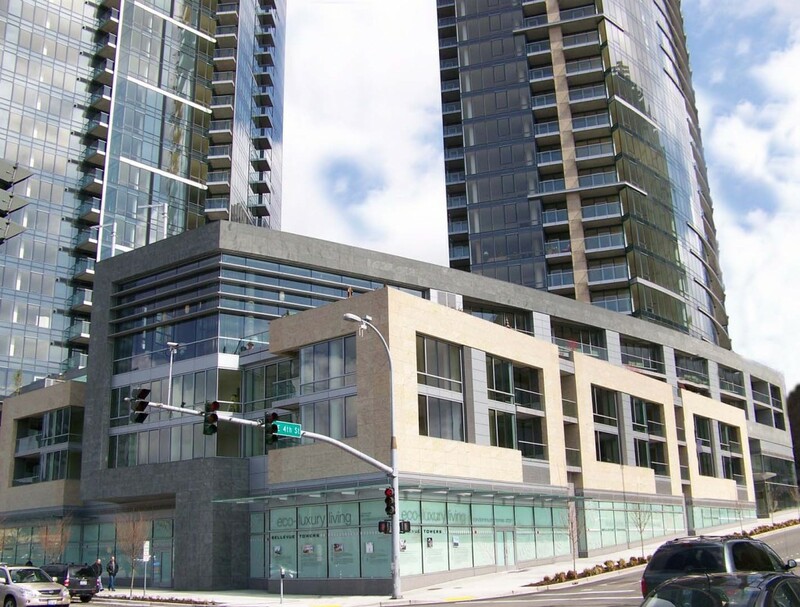 For Developer Gerding Edlen, the idea of the Joint Venture of GBD Architects and MulvannyG2 Architecture was to bring sustainable urban living and active street life to Bellevue through these two landmark high-rises. The 1.25 million square foot development delivered 550 luxury residential units in adjacent 42 story and 43 story towers offering stunning views of the Olympic Mountain Range, Mount Rainier, Lake Washington, and the Cascades. The design team was challenged with many goals such as achieving a LEED Gold rated status, create a contemporary design that would add to the Bellevue sky line and provide a building that could display art while being part of the art. The towers rest on a podium of amenity spaces, 19,000 square feet of retail, and parking for 875 vehicles in a total of 1.4 million square feet. The podium skin consists of three stone types which total 20,000 square feet and complement the interior stone pallet. The long radius walls, deep soffits, and complicated returns were a challenge, yet add to the design teams overall artistic theme. The final stone design included traditional flat areas of the exterior skin that were clad in stone, large geometric shapes that included deep returns and soffits, paving, stairs and a fireplace. The use of contrasting, yet complementing colors of stone help define different areas of the building. The exterior entries leading to the residential lobbies included 3,000 square feet of stonework. These features also mirror the interior color pallet with granite stairs, paving, and benches. The sitework features create a lasting impression for customers, residents, and associates as they enter and exit the building.